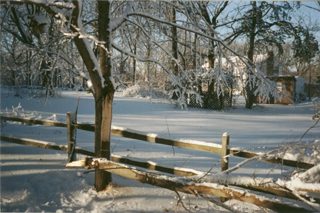 In December 2002, heavy snow tore off a branch from a small maple tree in our back yard. It was two months before a (relatively) warm spell allowed us to take a close look at the tree. Unfortunately, there was a decent amount of damage to the tree so we decided to cut it down when time allowed. We cut the tree down in February 2003 and it sat in the garage for over a year while I debated its fate. Nothing worthwhile surfaced and eventually, I gave the large parts of the tree trunk to my neighbor to burn in his wood stove. I kept some of the smaller stock just in case I came up with an interesting project. 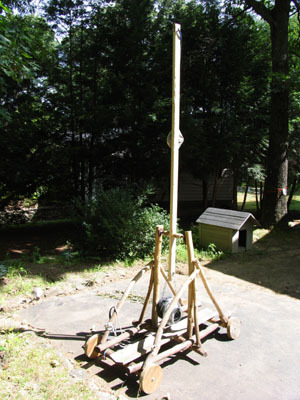 Then one day, for no particular reason, I decided to build a trebuchet. While the actual total construction time was only a few hours, it took place over the span of many weeks. Small incremental steps were taken with pauses in-between to consider the next steps. 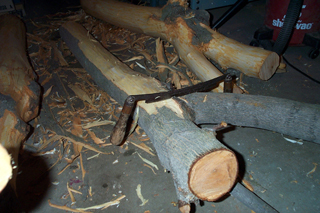 Before use, the bark from the maple tree was stripped. This actually took place shortly after the tree was cut down. Suffice it to say that the process made a mess and since it was winter at the time, the bark didn't exactly peel off easily. 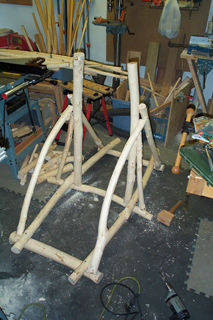 Taking into account the available maple stock, I selected pieces for the major parts of the trebuchet. 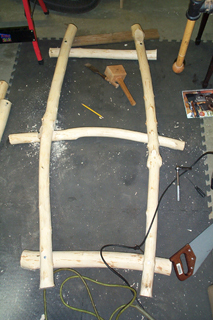 First was the arm - it had to be relativelty straight yet be stout enough to support an axle, weight and rotational forces. The length of the arm defined the rest of the dimensions. 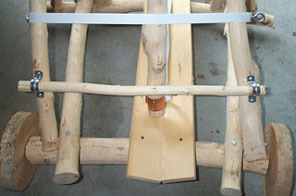 The basic frame consists of 5 pieces of maple connected with lag screws. Two vertical posts support the main horizontal axle for the arm. 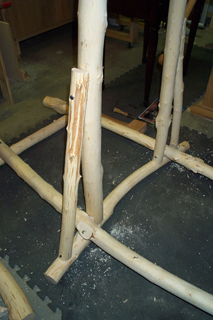 These posts are braces on three sides to handle the large stresses of launching a projectile. 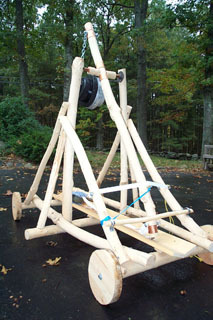 For this trebuchet, I wanted to use wheels. Not only would wheels give the unit more throwing distance but it would also make the unit more mobile. 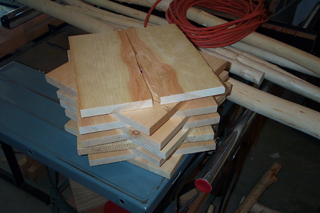 For wood, I decided to make use of 12x12 pine I broke during karate class tests. I sawed the boards into strips. Each wheel is made of two layers of pine set perpendicular to each other. A bunch of 1-1/4 inch screws hold the layers together. A single lag screw holds each wheel in place. The axle proved to be quite tricky. 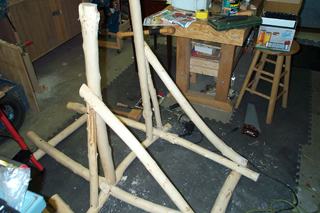 My original plan was to power the trebuchet with about 40 pounds of weight so I needed sturdy parts everywhere. The main vertical posts were very rigid and more than capable of holding the weight. What worried me was the rustic nature of the lumber - there are no straight line to work with; everything will have to be fitted on the spot. I spent quite some time at the local Home Depot, until I found my axle in the plumbing department. The axle consists of a metal pipe threaded at both ends, two flanges to hold the pipe, two short pieces of copper pipe as spacers to give me clearance to screw in the flanges, and a series of wooden spacers as additional seperators. Each vertical post was hacked to provide a roughly vertical surface on which to mount the flanges. A single hole was drilled through the arm to fit the axle. Everything else was threaded onto the pipe. 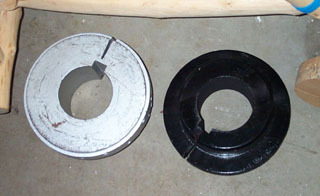 The wooden disks were waxed to minimize friction. The final assembly was shimmed on each side and screwed into place. The next big challenger was the weight mount. I considered a number of inexpensive alternatives - gravel and sand were the most promising. However each required a strong container; one strong enough to withstand the dynamic forces that would be present. What I really wanted to use were metal barbells weights but that would go against the keep-it-cheap goal. Then one day, we came across these strange looking metal objects at the town recycling center. They each weigh 30 pounds and best of all, the price was right :) A little sandpaper and spray paint took care of the rust. 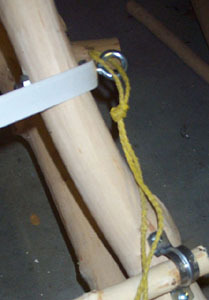 The original plan was to thread a single rod through the arm and attach a chain from both sides. Finding the right parts with the right dimensions for this turned out to be harder than I expected so I went to plan B. Two lag screws and some washers now hold a 36 inch metal chain. The length of the chain is adjustable via a QuickLink. 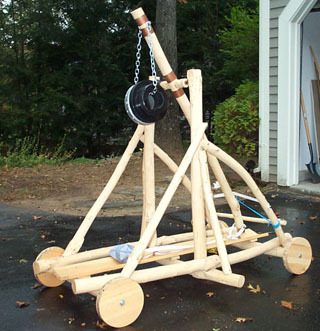 This method also allows the weight to be stored seperately and mounted only when needed; a safer way to move and store the trebuchet. It's been almost a year since I last touched this thing. Two weeks ago, we took it outside and launched all sorts of projectiles - mostly apples, potatoes, tennis balls and a orange. We learned a few things and brought the contraption back in for its final touches. I was going to use an old pair of jeans to make the sling. My wife handed me a spool of belting - a lining material used on the inside of belts. She inserted grommets on both ends and the result is a very strong and flexible sling. 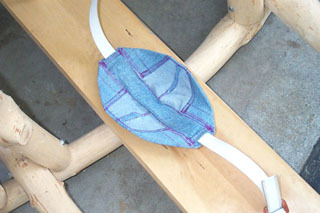 The basket which holds the projectile is from the old jeans. It is sewn slightly cupped to help hold the projectile. The belting snakes through a center channel. 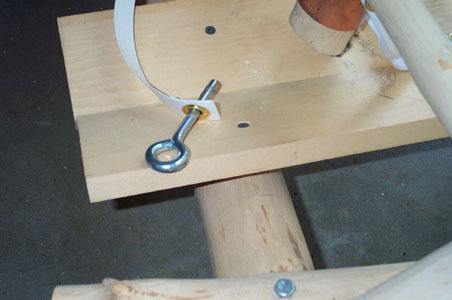 To allow some level of adjustments, the belting ends in a metal D-ring and doubles back. As the sling is lengthened or shortened, the basket is moved along the belting to the desired location. A single staple locks it to the belting. 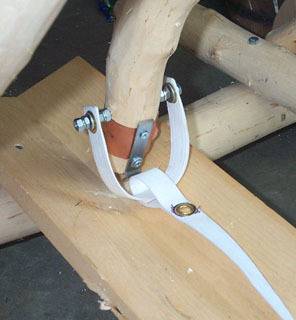 On the "arm" end, the sling is attached to the arm on both sides of the arm. This arrangement gives a balanced force on the sling so it doesn't swing left or right too much. The D-ring connects to a small metal bar screwed to the end of the arm. The shape of this metal bar is important - it determines the release angle of the sling. Release the sling to early and the projectile may go straight up. Release it to late and it will drive straight into the ground. The hard part is getting an angle that can still catch the D-ring yet release it early enough for a proper projectile flight path. The trigger mechanism also uses belting material. 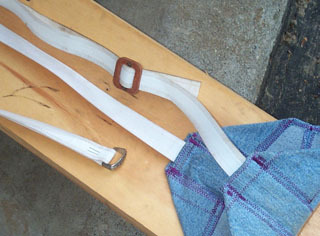 A piece of belting with grommets on each end is stretched across the path of the arm. One side is screwed into the wooden support beam. 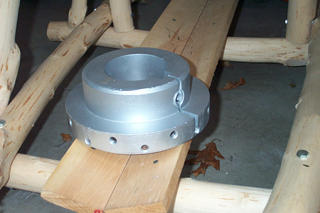 The other side is held in place by a cut-off bolt. 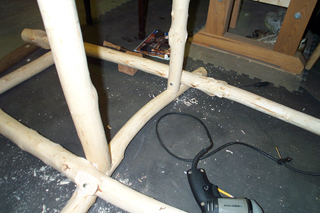 A short piece of 1/2 inch plumbing pipe is inserted into the support beam; screws hold it in place from both sides. 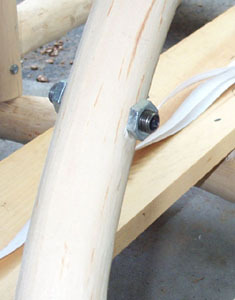 The threaded portion of the bolt has been cut off and the end ground round (for safety). To arm the device, the bolt (key) is placed through the grommet and into the plumbing pipe. Pulling the rope on the key releases the belting and thus the arm. Automotive grease is used to lubricate the key. To make it easier to arm, the trigger belting does not have to be extremely taut when the key is inserted. 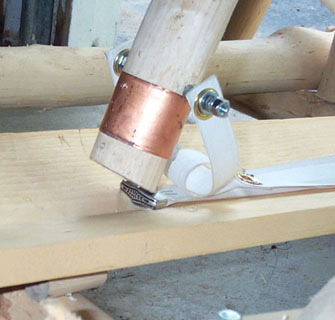 An additional spacer (a block of wood) is inserted between the arm and the trigger to force the arm down to the channel where the D-ring can stay hooked onto the release bar. 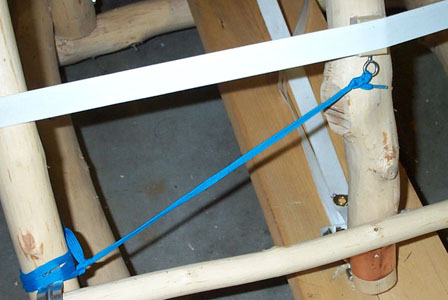 A blue shoelace hold this spacer block to one side of the device so that when it releases, it won't fly over to the other side of the arm and get tangled up with the sling's path of motion. It became obvious from the trial runs that a single 29+ pound weight just wasn't enough. So the second weight was sanded down and painted (black this time; ran out of silver paint!). One weight is dangerous enough; two is even more so. A safety bar is installed at the bottom of the arm's path to prevent accidental firings. Metal 1 inch pipe clamps loosely hold it in place. For the past few years, the trebuchet has been stored outdoors under a plastic tarp. Needless to say, this was not the best environment for wood. There were cracks in the timbers and rust was starting to show on some of the metal hardware. It was still in usable shape but I knew it wouldn't last much longer. For the past few years, we've taken the unit to our local school for an annual launch of fruits and vegetables (donated by the local Stop & Shop). The 5th grade kids did a unit on simple machines via catapults and other similar devices. 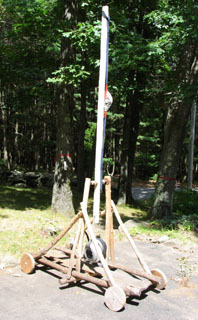 So in June 2010 we took the trebuchet to the Mill Pond school for one last show and tell. See the video at the top of the page. But before retirement, I made one last change - the Rev 2 arm. The arm on the trebuchet had always been too short. 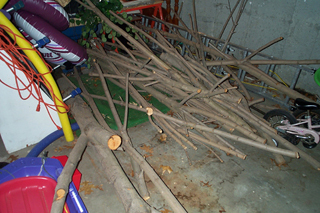 It's length was originally dictated by the length of the wood I had on-hand when the maple tree blew over. I'd always wondered if the unit would perform better with a longer arm. So with the eminent retirement, I made Rev 2 in about 10 minutes. The old arm was removed and a new 8 ft arm made from a 2x3 was added. I didn't bother to length the sling since that would have required more than the few minutes I wanted to invest. Subjectively, I think the new arm led to a slightly better release point for the sling for more consistency on throws but the overall throw distance didn't really change that much. I made no changes to the release hook angle; but since the arm is longer, the angle is not as steep and that alone will tend to hold the payload better at launch time. We unloaded some potatoes and apples with the new arm, shot a video, then disassembled the unit. It was a blast! Note: The contents in these pages are provided without any guarantee, written or implied. Readers are free to use them at their own risk, for personal use only. No commercial use is allowed without prior written consent from the author.